On the edge of Belarus’s Chernobyl exclusion zone, down the road from the signs warning “Stop! Radiation,” a dairy farmer offers his visitors a glass of freshly drawn milk. A laboratory confirms it contains levels of a radioactive isotope at levels 10 times higher than the nation’s food safety limits. 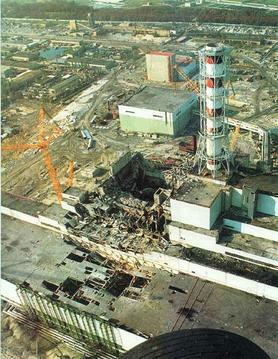 That finding on the eve of the 30th anniversary of the world’s worst nuclear accident indicates how fallout from the April 26 1986 explosion at the plant in neighbouring Ukraine continues to taint life in Belarus. The government of this agriculture-dependent nation appears determined to restore long-idle land to farm use . The farmer, Nikolai Chubenok, proudly says his herd of 50 dairy cows produces up to two tons of milk a day for the local factory of Milkavita, whose brand of Parmesan cheese is sold chiefly in Russia. Milkavita officials called the AP-commissioned lab finding “impossible,” insisting their own tests show their milk supply contains traces of radioactive isotopes well below safety limits. Yet a tour along the edge of the Polesie Radioecological Reserve, an 835 square mile ghost landscape of 470 evacuated villages and towns, reveals a nation showing little regard for the potentially cancer-causing isotopes still to be found in the soil. Farmers suggest the lack of mutations and other glaring health problems mean Chernobyl’s troubles can be consigned to history. “There is no danger. How can you be afraid of radiation?” said Chubenok, who since 2014 has produced milk from his farm just 30 miles north of the shuttered Chernobyl site, and one mile from the boundary of a zone that remains officially off-limits to full-time human habitation. Chubenok says he hopes to double his herd size and start producing farmhouse cheese on site. His milk is part of the Milkavita supply chain for making Polesskiye brand cheese, about 90 per cent of which is sold in Russia, the rest domestically. The World Bank identifies Russia as the major market for Belarusian food exports, which represent 15 per cent of the country’s export economy. Since rising to power in 1994, President Alexander Lukashenko — the former director of a state-owned farm — has stopped resettlement programmes for people living near the mandatory exclusion zone and developed a long-term plan to raze empty villages and reclaim the land for crops and livestock. The Chernobyl explosion meant 138,000 Belarusians closest to the plant had to be resettled, while 200,000 others living nearby left voluntarily. One of the most prominent medical critics of the government’s approach to safeguarding the public from Chernobyl fallout, Dr Yuri Bandazhevsky, was removed as director of a Belarusian research institute and imprisoned in 2001 on corruption charges that international rights groups branded politically motivated. Since his 2005 parole he has resumed his research into Chernobyl-related cancers with European Union sponsorship. “We have a disaster,” he said. The milk sample subjected to analysis backs this picture. The state-run Minsk Centre of Hygiene and Epidemiology said it found strontium-90, a radioactive isotope linked to cancers and cardiovascular disease, in quantities 10 times higher than Belarusian food safety regulations allow. The test, like others in resource-strapped Belarus, was insufficiently sophisticated to test for heavier radioactive isotopes associated with nuclear fallout, including americium and variants of plutonium. The Belarusian Agriculture Ministry says levels of strontium-90 should not exceed 3.7 becquerels per kilogram in food and drink. Becquerels are a globally recognised unit of measurement for radioactivity. The Minsk lab said that the milk sample contained 37.5 becquerels. That radioactive isotope is, along with cesium-137, commonly produced during nuclear fission and generates most of the heat and penetrating radiation from nuclear waste. When consumed, scientists say strontium-90 mimics the behaviour of calcium in the human body, settling in bones. A person who answered the telephone at the press office of the Belarusian Emergency Situations Ministry, which is tasked with dealing with the fallout of the nuclear disaster, said they would not comment on the AP’s findings. Health officials say the danger level posed by low levels of radioactive isotopes depends greatly on length of exposure and individual physiology. Notably, the regional free-trade bloc that includes Belarus and Russia permits higher levels of strontium-90 in goods of up to 25 becquerels per kilogram, still lower than that detected in the AP-commissioned test. The question is whether anyone in authority is positioned to identify the true level of risks in produce from farms on the frontier of Belarus’s prohibited zone. The deputy director of Belarus’s Institute of Radiobiology, Natalya Timokhina, said Belarus permits food producers to conduct their own food safety monitoring and lacks the lab equipment necessary to identify the presence of americium, which is estimated to be present in about 2 per cent of Belarus’s top soil and is expected to remain a health risk for another 270 years. Ausrele Kesminiene, a doctor in the cancer research unit of the World Health Organisation, said the consumption of radioactive food is linked chiefly to the development of cancer in the thyroid, a gland in the neck that produces body-regulating hormones. Thyroid cancer is typically not fatal if diagnosed early. WHO officials say they are dependent on reports from sister agencies in Belarus to alert them to cancer clusters or other signs of unresolved Chernobyl-related dangers. Gregory Hartl, a WHO spokesman in Geneva, said the agency had no authority to regulate or oversee food safety — even products exported to other countries — because that is a domestic responsibility. Environmentalists critical of Belarus’s Chernobyl clean-up record says that’s hardly surprising, since the government has funded no machinery to scrutinise corrupt practices in the food industry. As a result, they say, no Belarusian food-maker has ever been prosecuted for using ingredients or producing goods containing excessive levels of radioactive materials. Driving toward Chernobyl and into the nearby Radioecological Reserve requires visitors to negotiate painstaking government permission. Inside the zone, Belarus has authorised an experimental farm to operate for the past decade. Today it contains 265 horses, 56 cows and apiaries buzzing with honey bees.